Dèesse Magazine: Beyonce Debuts Basquiat MINX !!! Beyonce Debuts Basquiat MINX !!! Beyoncé delighted her fans earlier this week by posting a photo of her favorite new Minx nail fashion on Instagram, showing the colorful Minx nail coatings that the singer wore for her New Year’s performance in Las Vegas earlier this month. 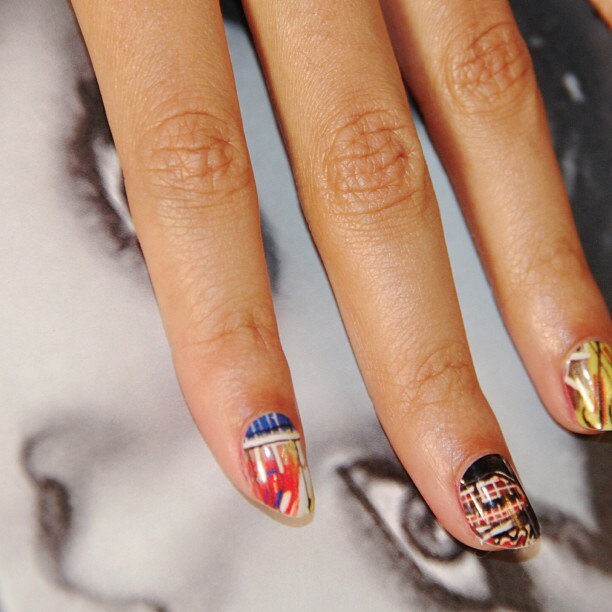 Celebrity nail stylist Lisa Logan, the magic behind Bee’s nails, tells us the singer was wearing a custom Minx design inspired by the artwork of Jean-Michel Basquiat. The late American artist is a favorite of both Beyoncé and Jay-Z. While that specific design is one–of-a-kind, Lisa says fans can purchase their own DIY Minx nails by logging on to thewww.MinxTastingRoom.com, or can have a set professionally applied at a Minx-certified salon found through thewww.MinxNails.com salon finder. The solid nail coating can be worn on either natural nails or tips and is a favorite of celebrities including Beyoncé, Katy Perry and Rihanna. New York celebrity nail stylist Lisa Logan was honored at Essence Magazine’s first annual “Best in Black Beauty Awards” on May 8, 2012 in New York City. Essence Magazine, the preeminent lifestyle publication for African-American women, created the awards to honor beauty innovators who are influencing what’s now and next. Lisa’s many career highlights include applying custom Minx to Beyoncé for her performance at the presidential inauguration, being named “Best Manicurist” in Star Magazine’s Beauty Awards issue, and designing two “Minx Professional for Lisa Logan” collections. Lisa also created the distinctive nail fashion for Italian Vogue’s March 2012 cover feature photographed by the legendary Steven Meisel. Lisa has added yet another landmark to her career as she officially opened her own salon in Harlem, “The Nail Suite by Lisa Logan,” where she will continue to offer her clients the newest and best in nail fashion. Appointments can be made at lisanailsuite@gmail.com.